Do you find it difficult to determine the length of content and the type of content you should be writing for your website? A common question I am asked is “how much content do I need to write for my website pages?” There is no magic number! In this post, I will walk through some key components and tips you need to keep in mind when creating content for your website. This format will ensure you know exactly what you need to do when constructing content and putting it out there. Sometimes, we forget that content needs to follow a particular format, so that it can reach the right audience and keep them engaged. Your audience is the key foundation when creating website copy. Who is this content targeted to? What type of information are they looking for? Remember, whilst you will be writing about something you understand, it’s all about them and not you. Create a buyer persona. Have this person in mind when you are writing. Put yourself in their shoes to determine how you will address their questions or concerns. You hold the key to the answers they have been searching for! Once you know who you are writing for, it’s time to work out your topic and add a catchy title. Remember, in this day and age, you are competing with loads of other websites, trying to achieve a similar outcome. If you want your content to stand out from the crowd, you need a compelling title that will draw readers in and be on point with the topic you have chosen. Brainstorm some ideas, keeping in mind the length, include adjectives, numbers and the ‘how to’ and ‘what’ suggestions. 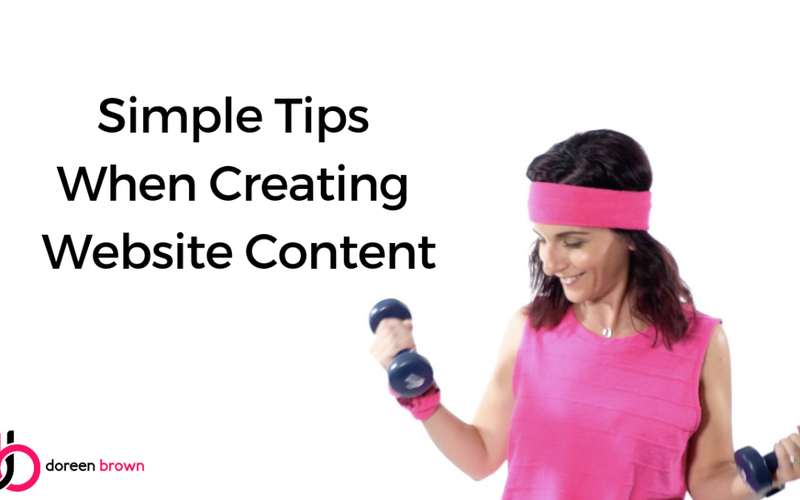 For example, in this actual post, the title is “Simple Tips When Creating Website Content.” This could also be changed to “What You Need To Know When Creating Website Content” or “How to Create Content for your Website.” The possibilities are endless. Stay on point, but make it enticing to attract your audience. As mentioned in the above point – ohhh baby, baby it’s a wide world. There are so many other sites out there competing for your Google position. If the opening sentences don’t leave readers wanting more, they will quite quickly pick somewhere else to go. Your introduction should outline exactly what your content is going to offer and what’s in it for them. What can your audience take away from reading this piece? Will it be 5 minutes of their life they will never get back? You want to ensure that your end goal is clearly outlined, making it of value for others to enjoy and learn from. Breaking your content down into sections (like this post!) will make it easier to read. Trying to squeeze it all into one big paragraph is not the ideal way to go. Before you start writing, select the main areas of the topic you are wanting to write about. Also ensure that the order of your main points make sense, so that you are engaging your audience and not leaving them feeling confused about the flow. At the end of your content, a CTA is a must. What is it that you want your reader to do once they have read your content? Is there a newsletter they can sign up for, or perhaps they need your area of expertise further to help them out? It’s all about addressing and meeting needs. Your content needs to be created so that it is helping someone find the answers they are searching for. It’s not about creating content just for search engines. If you are doing this with that intention, you will soon find that your audience will go elsewhere for better value. Don’t leave people hanging, let them know what else they can do and how you might be able to further assist with an effective CTA. It’s time. Now that you have the bones of your content mapped out, you can start putting pen to paper, or fingers to keyboard and let that juice flow. Get all of your thoughts and facts down – even if it isn’t perfect on your first attempt, just begin. Whilst you are the expert in your field, you may also lean on other online resources to help you along. By doing this, you will soon find that you are learning new things yourself and progressively getting better at being an author. Your content will need to be reviewed, updated and changed so get your ideas down and adjust as you go. Need some extra support to get going? Reach out today and organise a chat. Let Doreen Brown Consulting help you with your content needs. Send an email, or call today on 0433 603 522. What Are Image Alt Tags & Why Are They Important?